I bought these bookmarks for the October Respect Life month at my parish. I pray the message rings clear to those who are not really ‘getting’ the pro-life message. One of my favorite bookmarks for the literature table, and for me, too! I love that all three scripture verses are together in one place. I hand these out to the young and old. Everyone is touched by the pictures of these little ones in the womb. So small and so perfectly made. 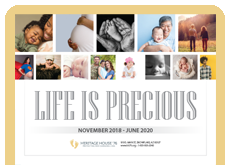 The images are impressive, the fact that you get to see what prolife activists keep saying gives a lot of help on our prolife activities. Very liked by everyone and great material quality. Want all models now! I love these bookmarks as it shows the development of an unborn baby -it is simple, but beautiful! These bookmarks are staples at our pro-life promotions at our church. They go fast, but I try to have a supply to pass out when people ask about abortion and what to tell people when they ask. I use them to instruct and to encourage others to do the same. Great item! At our recent Respect Life booth we displayed these beautifully graphic cards beside the life-like fetal models. One of our parishioners, who is a sidewalk counselor, saw them. Now she is excited that we can provide them to her for her ministry. These bookmarks are always one of the first to be taken in our fair building. Powerful message and powerful photos. We love to give them out in teen packages so youth have good visuals of unborn life. This bookmark is fantastic. It is a great tool for showing the development of the unborn baby. We like to hand out bookmarks at our county fair booth and this is one of the most popular. The development of the baby is easy to see. The 'soul at conception' cements the spiritual being. We use this at the pro-life booth at our county fair when the theme is "Life is a continuum". I think this gives the most "bang for your buck". The pictures are truly convincing and the pro life scriptures on the back are are right to the point. I give these out in front of Planned Parenthood,slip them into magazines of waiting rooms, and leave them in public restrooms. I use these when I sidewalk counsel, speak to youth and at information tables. A picture is worth a 1000 words! This little card speaks volumes in the images of a baby's development in the womb. I love watching how intently people look at the pictures and the smiles that cross their faces and sometimes surprise. The Scripture passages are familiar but when joined with these images and especially the Soul panel we are called to an understanding with an intimate personal connection to God and all His children. So much is made known and then integrated into one's understanding of personhood by these images and scripture together. This was one of the first things I ever ordered from Heritage House. The message on the bookmark is wonderful, and the unborn babies only serve to reinforce the words.